Ready to explore Eastern Florida? 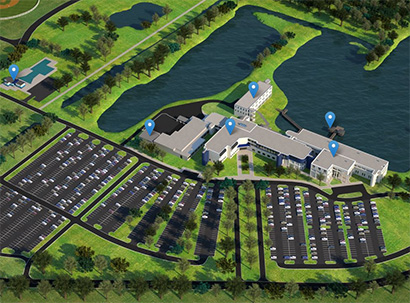 Get a sneak peek of the Palm Bay Campus with our new virtual video tour and interactive map. Click to get started today! 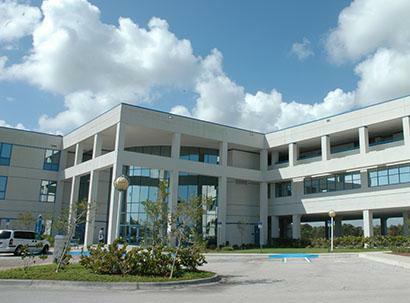 The General Titus C. Hall Center anchors the Palm Bay Campus in Brevard County's largest city. The Campus is just off the Malabar Road exit of I-95 and serves a diverse student population. 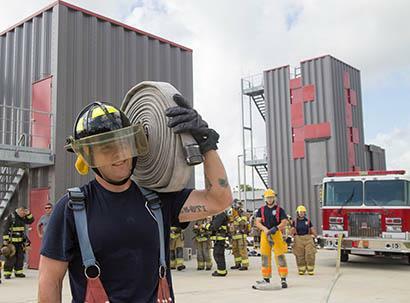 The state-of-the-art EFSC Fire Academy is located on the southern end of the Palm Bay Campus and features a burn tower, classrooms and multiple opportunities for hands-on training. 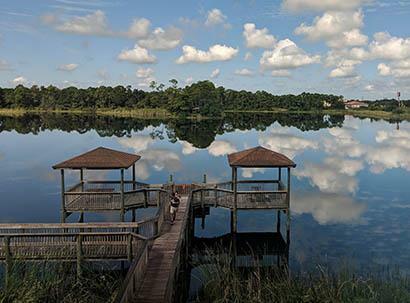 Students at Palm Bay Campus enjoy the tranquil natural surroundings, often studying and taking part in activities at the Lake Titan pavilion and the patio lounge. Palm Bay's Student Government Association (SGA) guides many different student clubs. From the Creative Writing Club to the Tech Club, there's one for nearly every interest. Dr Stein is a licensed psychologist who's practiced in Brevard County since 1988. He started his teaching career at the College in 1986. Beautiful Palm Bay Campus is situated on Lake Titan in the fastest growing and most culturally diverse community in Brevard County. Our faculty and professional staff are here to guide students to achieve their educational and professional career goals. Additionally, the University of Central Florida offers several baccalaureate programs on Palm Bay Campus, including Early Childhood Education, Psychology and Business.Our campus serves our diverse population through many program options. We offer the traditional Associate of Arts degree with courses that transfer to the baccalaureate degree. We also offer many technical, vocational and health science programs that prepare students to enter the workforce. Palm Bay is also proud to house the Spring semester intake nursing program for the College. Part of EFSC's mission is to engage the community, and Palm Bay Campus does so in many ways. Many students volunteer through our Office for Service-Learning. The Career Center at our Campus offers many services to guide first-time career seekers as well as those needing to transition to a new field. As part of our Professional Educator's Lecture Series, Palm Bay faculty and staff offer free presentations on diverse and engaging topics. Come see us or introduce yourself to us through the website. Welcome to the Palm Bay Campus, your pathway to your future! Meet a teacher who makes our natural environment come to life through hands-on experience. Class field trips include an aquarium sleepover & snorkeling at a coral reef. Her research interest is coral ecology, with the goal of reef restoration & preservation.